NEWYORK ? A NASA spacecraft aimed at Mercury has already returned valuable observationsfrom the planet closest to our sun, despite still being months away fromentering orbit around the small, rocky world, the mission's lead scientist said. SeanSolomon, principal investigator for NASA's MESSENGER mission, said the spacecraftis poised to enter orbit around Mercury next March to build the most detailedmaps ever made of the planet. "Mercuryis not what we thought it was even 2 1/2 years ago," Solomon said during apublic lecture this week at the American Museum of Natural History here as partof the 73rd Annual Meeting of the Meteoritical Society. After three flybys of Mercury, MESSENGER has beamed home stunning views of the cratered world and provided a fresh look into its volcanic past and tenuous atmosphere. But the best is still to come, Solomon said. 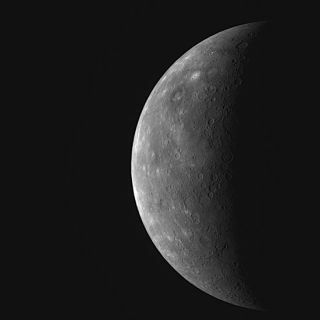 NASA'sMESSENGER probe, short for MErcury Surface, Space ENvironment, GEochemistry,and Ranging, is the first spacecraft to examine Mercury up close since thespace agency's Mariner 10 mission in the mid-1970s. Inaddition to the new global maps, MESSENGER scientists hope the mission willfind new clues on how Mercury was formed, how it evolved, and how it generated its magneticfield. "We'retrying to learn how a planet very near its host star differs from others thatare more far out and more massive," Solomon said. "Exploring theinner part of our solar system is to understand our place in the solarsystem." WhileMESSENGER's main mission is to orbit Mercury, the probe had to perform six different flybys that took it past Earth once, Venus twice and Mercury three times.Each time, the spacecraft used the gravity of each planet flyby to refine itsflight path through space. Thegravitational tugs from the flybys also work to slow the spacecraft's speedenough so that MESSENGER's propulsion system can successfully execute itsscheduled "orbital insertion" on March 18, 2011, putting thespacecraft in an elliptical orbit around Mercury. "Wecould have gotten to Mercury in four or five months, as Mariner 10 did, but wecan't get into orbit flying that fast," Solomon said. "We have to begoing by Mercury slowly enough so that the propulsion system can perform theorbit insertion." Threeof the six flybys had MESSENGER swooping by Mercury itself ? in January andOctober of 2008, then again in September 2009. Theflyby events allowed the probe to snap pictures of Mercury's surface, enabling scientists to map the planet inunprecedented detail. The first flyby alone returned 1,317 images. Inone of the flybys, MESSENGER was also able to take measurements of the planet'smagnetic field over one hemisphere. Mercury was found to have a dominantlydipolar magnetic field ? with opposite magnetic poles ? with the dipole beingclosely aligned with the planet's spin axis, said Solomon. Thisseems to suggest that Mercury's magnetic field is similar to Earth, and waspossibly generated in the same way. Once MESSENGER enters the orbital stage ofits mission, researchers will be able to study this in greater detail.Scientists will also be interested in looking for evidence of volcanicprocesses on Mercury, said Solomon. MESSENGERis expected to enter Mercury's orbit on March 18, 2011. The propulsion systemwill fire for 15 minutes, placing the spacecraft in an initial orbit aroundMercury at an altitude of 124 miles (200 km). Eachelliptical orbit will last 12 hours, meaning the probe will circle the planettwice per Earth day. At the time of orbit insertion, MESSENGER will be 28.7million miles (46.1 million km) from the sun, and 96.4 million miles (155.1million km) away from Earth. The$446 million MESSENGER spacecraft launched in August 2004 and is fully fundedto orbit Mercury for one Earth year, which is equivalent to just over four ofMercury's 88-day years. Solomon is currently writing a proposal to extend themission beyond the initial timeframe. "Wethink we have ample propellant not only for that one year, but probably for ayear or two after that," Solomon said. "But, we'll eventually run outof propellant or NASA dollars, and that will cause the probe to impact thesurface." Still,the MESSENGER probe has already yielded important results, and has paved theway for future missions to our innermost planet ? including a joint EuropeanSpace Agency and Japanese space agency (JAXA) mission that will launch twospacecraft in 2014 to study Mercury. Andbeyond that, Solomon has his sights set on a future sample-return mission to Mercury. "It'llprobably not happen nearly as soon as one to an asteroid and eventually Mars,but I think it's the next thing to do," Solomon said.